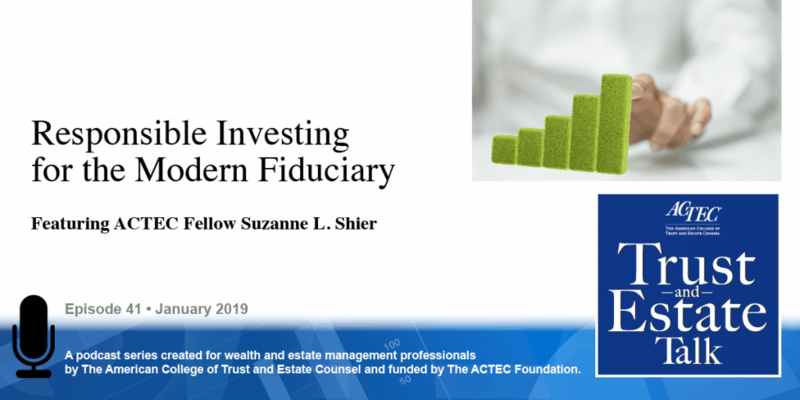 “Responsible Investing for the Modern Fiduciary,” that’s the subject of today’s ACTEC Trust and Estate Talk. This is Susan Snyder, ACTEC Fellow from Chicago. How does sustainable and responsible investing intersect with fiduciary duty? 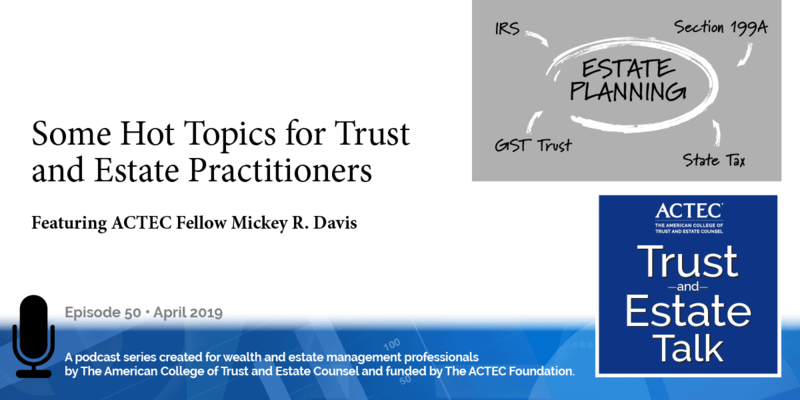 May a trustee consider environmental, social, and governance, or ESG, factors when she makes investment decisions for a trust? 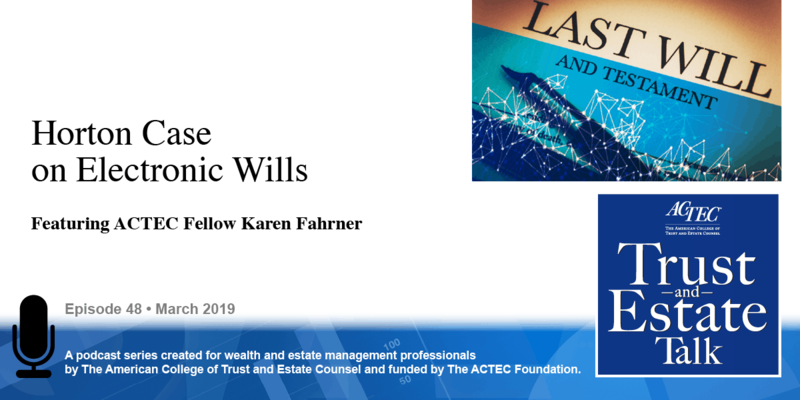 To learn more about this topic you will be hearing today from ACTEC Fellow Suzanne Shier of Chicago. Welcome, Suzanne. Thank you, Susan. Imagine you were sitting in your office, your client a fit, progressive principal at an inner city charter school has just decided he wants you to serve as co-trustee of the irrevocable trust that his father set up. The trust benefits his father’s grandchildren, in other words, your client’s two young children. Your client has visions of wind turbines and organic farms and certainly doesn’t want to invest in arms or weapons as there have been recent incidents at the school where he is principal, now the campus where his daughters go to school. As newly appointed co-trustee is it possible to make sustainable and responsible investments and uphold your fiduciary duties? It’s an interesting question I assume we first would start with the trust agreement? Absolutely, you pull out the trust document and flip to the powers and duties section, you will likely find reference to the Prudent Investor Rule but you will find little direct guidance with respect to sustainable and responsible investment strategy. So, you need to think about the duties, what are the three duties that will guide your decision making? They’re the duty of loyalty, the duty of impartiality, and- perhaps most importantly- the duty of prudent investment. The duty of loyalty requires a trustee to act solely in the interest of the trust beneficiaries. When non-financial considerations are introduced into the investment process for a trust the duty of loyalty requires that the considerations be those of the beneficiaries under the terms of the trust document, not the priorities of the trustee individually. If the settlor has not provided a statement of guiding principles then the views and priorities of the beneficiaries may potentially be brought to bear. When there are multiple beneficiaries it will be very difficult to balance the interests of multiple beneficiaries, but first and foremost we’re looking at this duty of loyalty. The bottom line is that when investing we must be doing this consistent with the duty of loyalty to the terms of the trust and the interest of the beneficiaries. So in our example, it sounds like the terms of the trust and the interests of the beneficiaries, under that duty of loyalty, will come first. So now, can you tell us a little bit about that duty of impartiality? So duty of loyalty to the trust and the beneficiaries, beneficiaries being plural, so we have multiple beneficiaries and we need to be impartial among the beneficiaries, we don’t necessarily need to be equal but we need to be impartial. So how might this be brought to bear with respect to sustainable and responsible investing? What if beneficiaries have different priorities? So that really makes sense and could you tell us a little bit about the third duty? And that is the duty of prudent investment. Of course, the Prudent Investor Rule has been restated in the Restatement, Third, of Trusts and it has been embodied in the Uniform Prudent Investor Act, now enacted in 43 states, plus Washington, DC and the US Virgin Islands. The basic rule is that a trustee has a duty to the beneficiaries to invest and manage the funds of a trust as a prudent investor would in light of the purposes, terms, distribution requirements, and other circumstances of the trust. Reasonable care and diversification are also factors. Unfortunately, there is very little authority that tells us whether the prudent investment can account for environmental, social, and governance factors. Many would argue, and evidence is mounting, that sustainable and responsible investments outperform over time. Certainly, no one would argue that environmental incidents in governance lapses are not in consideration in the performance of a company. But environmental, social, and governance investing is still a comparatively new discipline and reasonable minds can and do differ about whether investors can adjust financial returns when incorporating nonfinancial considerations into their investment process. The real heart of the question here is whether the duty of prudent investment is a static concept or whether it is a dynamic concept, one that accounts for current developments. So, speaking of developments can you share a bit about the news out of Delaware? I understand that Delaware’s on the forefront of ESG for fiduciaries. In making investment decisions, a fiduciary may consider the needs of the beneficiaries, when considering the needs of the beneficiaries the fiduciary may take into account the financial needs of the beneficiaries as well as the beneficiaries personal values, including the beneficiaries’ desire to engage in sustainable investing strategies that align with the beneficiaries social, environmental, governance, or other values or beliefs. 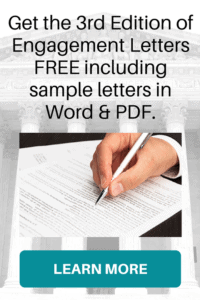 So, as you were sitting in your office if the trust you’re looking at is a Delaware situs trust, or governed by Delaware law, then you at least are not searching through Westlaw looking for precedent that will help you understand whether environmental, social, and governance considerations may be taken into account. Here you have some statutory authority, albeit very new, to guide your decision making. 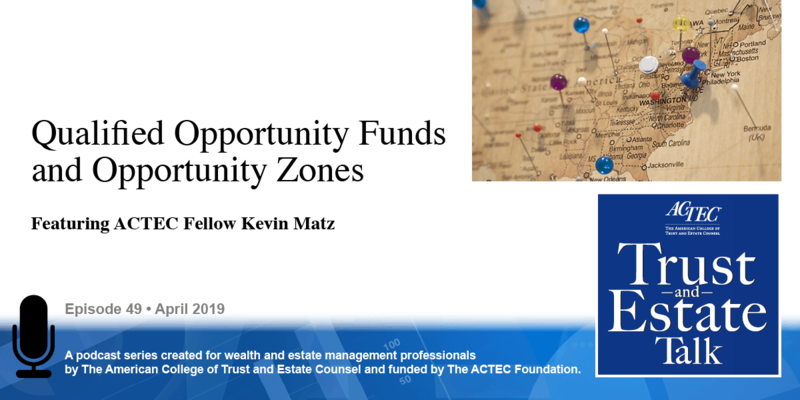 Now, to be clear, we are still all about the beneficiaries, if our co-trustee client wants to invest exclusively in companies that are aligned with a priority of his or her own, that doesn’t work. It’s only if the beneficiary feels strongly about a particular issue that you can adjust your investment making decisions. And we still have the consensus issue, in other words, not all beneficiaries will have the same values and not all beneficiaries will have the same interest in the trust itself; current and future, income and principle, mandatory and discretionary. But, Delaware gives us a start. So thank you Suzanne, for helping us understand sustainable and responsible investing for the modern fiduciary.